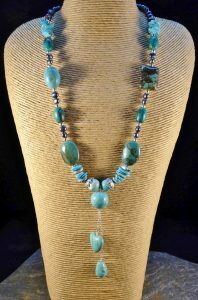 We really need a Talisman at the moment so I thought I’d tell you about Turquoise along with a necklace from my stock as an example. Tap on the image for a link to details of the piece. The colour varies from blue to green often with veining. It’s a copper and aluminium hydrated phosphate, much prized as a gemstone. 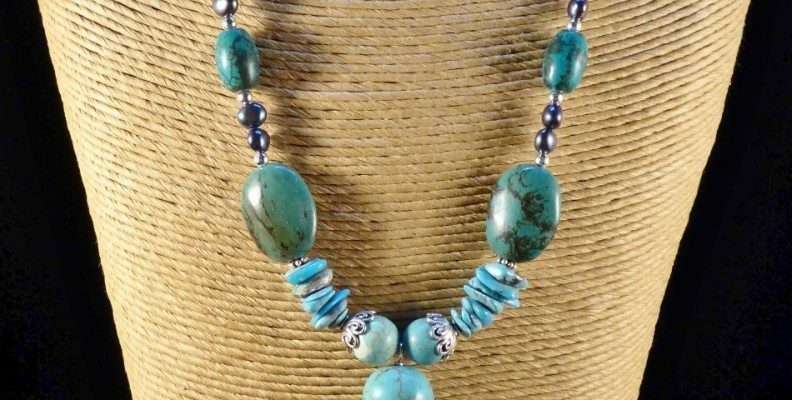 In antique jewellery the colour may have become more green with age, due to the reaction of the copper with the sulphur generally found in our air. This often makes it very difficult to find a matching stone when one is lost. 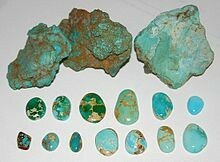 The word turquoise dates to the 17th century and is derived from the French turquois for “Turkish” because the mineral was first brought to Europe through Turkey from mines in Persia. The Aztecs knew it as ‘chalchihuitl’ and use it a lot in their jewellery. Why do we need a Talisman? Because we’re watching the water flood past us on it’s rush to the Thames. Having been waiting here, near Reading, for 10 days already, we really need the waters to subside and slow down, so we can set off for the Thames and London. We are due in Berkhamsted for my first market this year on 4th-7th May. Sounds like ages I know, but we need to leave here by the 18th April, to give us 2 weeks to cover the 94 miles and 75 locks between here and there. With all this rain, it could take 10 days or more before we’re allowed to travel again. The waterways are displaying “Red warning Do Not Travel” on the navigation and the Thames. So we have to wait for those to drop to Amber at least. Previous: How to find a Roving Canal Trader. Next: Berkhamsted Floating Market..My blog of our epic journey!